Areas where Norwegian is spoken, including North Dakota (where 0.4% of the population speaks Norwegian) and Minnesota (0.1% of the population) (Data: U.S. Census 2000). Norwegian (norsk) is a North Germanic language spoken mainly in Norway, where it is the official language. Along with Swedish and Danish, Norwegian forms a dialect continuum of more or less mutually intelligible local and regional varieties, and some Norwegian and Swedish dialects, in particular, are very close. These Scandinavian languages, together with Faroese and Icelandic as well as some extinct languages, constitute the North Germanic languages. Faroese and Icelandic are hardly mutually intelligible with Norwegian in their spoken form because continental Scandinavian has diverged from them. While the two Germanic languages with the greatest numbers of speakers, English and German, have close similarities with Norwegian, neither is mutually intelligible with it. Norwegian is a descendant of Old Norse, the common language of the Germanic peoples living in Scandinavia during the Viking Era. Today there are two official forms of written Norwegian, Bokmål (literally "book tongue") and Nynorsk ("new Norwegian"), each with its own variants. Bokmål developed from the Dano-Norwegian koiné language that evolved under the union of Denmark-Norway in the 16- and 17-century, while Nynorsk was developed based upon a collective of spoken Norwegian dialects. Norwegian is one of the two official languages in Norway. The other is Sami, spoken by some members of the Sami people, mostly in the Northern part of Norway. Norwegian and Sami are not mutually intelligible, as Sami belongs to the Finno-Ugric group of languages. Sami is spoken by less than one percent of people in Norway. Norwegian is one of the working languages of the Nordic Council. Under the Nordic Language Convention, citizens of the Nordic countries who speak Norwegian have the opportunity to use their native language when interacting with official bodies in other Nordic countries without being liable to any interpretation or translation costs. Like most of the languages in Europe, the Norwegian language descends from the Proto-Indo-European language spoken about 5500 years ago on the Pontic–Caspian steppe north of the Black Sea. As early Indo-Europeans spread across Europe, they became isolated and new languages evolved. In the northwest of Europe, the West Germanic languages evolved, which would eventually become English, Dutch, German, and the North Germanic languages, of which Norwegian is one. Proto-Norse is thought to have evolved as a northern dialect of Proto-Germanic during the first centuries AD. It is the earliest stage of a characteristically North Germanic language, and the language attested in the Elder Futhark inscriptions, the oldest form of the runic alphabets. A number of inscriptions are memorials to the dead, while others are magical in content. The oldest are carved on loose objects, while later ones are chiseled in runestones. They are the oldest written record of any Germanic language. Around 800 AD, the script was simplified to the Younger Futhark, and inscriptions became more abundant. At the same time, the beginning of the Viking Age led to the spread of Old Norse to Iceland, Greenland, and the Faroe Islands. Viking colonies also existed in parts of the British Isles, France (Normandy), and Kievan Rus. In all of these places except Iceland and the Faroes, Old Norse speakers went extinct or were absorbed into the local population. Around 1030, Christianity came to Scandinavia, bringing with it an influx of Latin borrowings and the Roman alphabet. These new words were related to church practices and ceremonies, although many other loanwords related to general culture also entered the language. The Scandinavian languages at this time are not considered to be separate languages, although there were minor differences among what are customarily called Old Icelandic, Old Norwegian, Old Gutnish, Old Danish, and Old Swedish. The economic and political dominance of the Hanseatic League between 1250 and 1450 in the main Scandinavian cities brought large Middle Low German-speaking populations to Norway. The influence of their language on Scandinavian is similar to that of French on English after the Norman conquest. In the late Middle Ages, dialects began to develop in Scandinavia because the population was rural and little travel occurred. When the Reformation came from Germany, Martin Luther's High German translation of the Bible was quickly translated into Swedish, Danish, and Icelandic. Norway entered a union with Denmark in 1397. Danish was the language of the elite, the church, literature, and the law. When the union with Denmark ended in 1814, the Dano-Norwegian koiné had become the mother tongue of many Norwegians. From the 1840s, some writers experimented with a Norwegianised Danish by incorporating words that were descriptive of Norwegian scenery and folk life, and adopting a more Norwegian syntax. Knud Knudsen proposed to change spelling and inflection in accordance with the Dano-Norwegian koiné, known as "cultivated everyday speech." A small adjustment in this direction was implemented in the first official reform of the Danish language in Norway in 1862 and more extensively after his death in two official reforms in 1907 and 1917. Meanwhile, a nationalistic movement strove for the development of a new written Norwegian. Ivar Aasen, a botanist and self-taught linguist, began his work to create a new Norwegian language at the age of 22. He traveled around the country collecting words and examples of grammar from the dialects and comparing the dialects among the different regions. He examined the development of Icelandic, which had largely escaped the influences under which Norwegian had come. He called his work, which was published in several books from 1848 to 1873, Landsmål, meaning "national language". The name "Landsmål" is sometimes interpreted as "rural language" or "country language", but this was clearly not Aasen's intended meaning. After the personal union with Sweden was dissolved in 1905, both languages were developed further and reached what is now considered their classic forms after a reform in 1917. Riksmål was in 1929 officially renamed Bokmål (literally "book language"), and Landsmål to Nynorsk (literally "new Norwegian"). A proposition to substitute Danish-Norwegian (dansk-norsk) for Bokmål lost in parliament by a single vote. The name Nynorsk, the linguistic term for modern Norwegian, was chosen to contrast with Danish and emphasis on the historical connection to Old Norwegian. Today, this meaning is often lost, and it is commonly mistaken as a "new" Norwegian in contrast to the "real" Norwegian Bokmål. Bokmål and Nynorsk were made closer by a reform in 1938. This was a result of a state policy to merge Nynorsk and Bokmål into a single language, to be called Samnorsk. A 1946 poll showed that this policy was supported by 79% of Norwegians at the time. However, opponents of the official policy still managed to create a massive protest movement against Samnorsk in the 1950s, fighting in particular the use of "radical" forms in Bokmål text books in schools. In the reform in 1959, the 1938 reform was partially reversed in Bokmål, but Nynorsk was changed further towards Bokmål. Since then Bokmål has reverted even further toward traditional Riksmål, while Nynorsk still adheres to the 1959 standard. Therefore, a small minority of Nynorsk enthusiasts use a more conservative standard called Høgnorsk. The Samnorsk policy had little influence after 1960, and was officially abandoned in 2002. While the sound systems of Norwegian and Swedish are similar, considerable variation exists among the dialects. The retroflex consonants only appear in East Norwegian dialects as a result of sandhi, combining /ɾ/ with /d/, /l/, /n/, /s/, and /t/. The realization of the rhotic /ɾ/ depends on the dialect. In Eastern, Central, and Northern Norwegian dialects, it is a tap [ɾ], whereas in Western and Southern Norway, and for some speakers also in Eastern Norway, it is rendered more gutturally as [χ] or [ʁ]. And in the dialects of North-Western Norway, it is realized as [r], much like the trilled R of Spanish. Norwegian is a pitch-accent language with two distinct pitch patterns, like Swedish. They are used to differentiate two-syllable words with otherwise identical pronunciation. For example, in many East Norwegian dialects, the word "bønder" (farmers) is pronounced using tone 1, while "bønner" (beans or prayers) uses tone 2. Though spelling differences occasionally differentiate written words, in most cases the minimal pairs are written alike, since written Norwegian has no explicit accent marks. In most eastern low-tone dialects, accent 1 uses a low flat pitch in the first syllable, while accent 2 uses a high, sharply falling pitch in the first syllable and a low pitch in the beginning of the second syllable. In both accents, these pitch movements are followed by a rise of intonational nature (phrase accent)—the size (and presence) of which signals emphasis or focus, and corresponds in function to the normal accent in languages that lack lexical tone, such as English. That rise culminates in the final syllable of an accentual phrase, while the utterance-final fall common in most languages is either very small or absent. There are significant variations in pitch accent between dialects. Thus, in most of western and northern Norway (the so-called high-pitch dialects) accent 1 is falling, while accent 2 is rising in the first syllable and falling in the second syllable or somewhere around the syllable boundary. The pitch accents (as well as the peculiar phrase accent in the low-tone dialects) give the Norwegian language a "singing" quality that makes it easy to distinguish from other languages. Accent 1 generally occurs in words that were monosyllabic in Old Norse, and accent 2 in words that were polysyllabic. Danish keyboard with keys for Æ, Ø, and Å. On Norwegian keyboards, the Æ and Ø are swapped. The Norwegian alphabet has 29 letters. The letters c, q, w, x and z are only used in loanwords. As loanwords are assimilated into Norwegian, their spelling might change to reflect Norwegian pronunciation and the principles of Norwegian orthography, e.g. zebra in Norwegian is written sebra. Due to historical reasons, some otherwise Norwegian family names are also written using these letters. Some letters may be modified by diacritics: é, è, ê, ó, ò, and ô. In Nynorsk, ì and ù and ỳ are occasionally seen as well. The diacritics are not compulsory, but may in a few cases distinguish between different meanings of the word, e.g. : for (for/to), fór (went), fòr (furrow) and fôr (fodder). Loanwords may be spelled with other diacritics, most notably ü, á and à. As established by law and government policy, the two official forms of written Norwegian are Bokmål (literally "book tongue") and Nynorsk ("new Norwegian"). The official Norwegian Language Council (Språkrådet) is responsible for regulating the two forms, and recommends the terms "Norwegian Bokmål" and "Norwegian Nynorsk" in English. Two other written forms without official status also exist, one, called Riksmål ("national language"), is today to a large extent the same language as Bokmål though somewhat closer to the Danish language. It is regulated by the unofficial Norwegian Academy, which translates the name as "Standard Norwegian". The other is Høgnorsk ("High Norwegian"), a more purist form of Nynorsk, which maintains the language in an original form as given by Ivar Aasen and rejects most of the reforms from the 20th century; this form has limited use. Nynorsk and Bokmål provide standards for how to write Norwegian, but not for how to speak the language. No standard of spoken Norwegian is officially sanctioned, and most Norwegians speak their own dialects in all circumstances. Thus, unlike in many other countries, the use of any Norwegian dialect, whether it coincides with the written norms or not, is accepted as correct spoken Norwegian. However, in areas where East Norwegian dialects are used, a tendency exists to accept a de facto spoken standard for this particular regional dialect, Urban East Norwegian or Standard East Norwegian (Norwegian: Standard Østnorsk), in which the vocabulary coincides with Bokmål. Outside Eastern Norway, this spoken variation is not used. From the 16th to the 19th centuries, Danish was the standard written language of Norway. As a result, the development of modern written Norwegian has been subject to strong controversy related to nationalism, rural versus urban discourse, and Norway's literary history. Historically, Bokmål is a Norwegianised variety of Danish, while Nynorsk is a language form based on Norwegian dialects and puristic opposition to Danish. The now-abandoned official policy to merge Bokmål and Nynorsk into one common language called Samnorsk through a series of spelling reforms has created a wide spectrum of varieties of both Bokmål and Nynorsk. The unofficial form known as Riksmål is considered more conservative than Bokmål and is far closer to Danish while the unofficial Høgnorsk is more conservative than Nynorsk and is far closer to Faroese, Icelandic and Old Norse. Norwegians are educated in both Bokmål and Nynorsk. The language form that is not registered as the main language form of a Norwegian student will be a mandatory school subject in both high school and elementary school for the student, which is called Sidemål. For instance, a Norwegian with Bokmål as its main language form has Nynorsk as a mandatory school subject throughout both high school and elementary school. A 2005 poll indicates that 86.3% use primarily Bokmål as their daily written language, 5.5% use both Bokmål and Nynorsk, and 7.5% use primarily Nynorsk. Thus, 13% are frequently writing Nynorsk, though the majority speak dialects that resemble Nynorsk more closely than Bokmål. Broadly speaking, Nynorsk writing is widespread in western Norway, though not in major urban areas, and also in the upper parts of mountain valleys in the southern and eastern parts of Norway. Examples are Setesdal, the western part of Telemark county (fylke) and several municipalities in Hallingdal, Valdres, and Gudbrandsdalen. It is little used elsewhere, but 30–40 years ago, it also had strongholds in many rural parts of Trøndelag (mid-Norway) and the southern part of northern Norway (Nordland county). Today, not only is Nynorsk the official language of four of the 19 Norwegian counties, but also of many municipalities in five other counties. NRK, the Norwegian broadcasting corporation, broadcasts in both Bokmål and Nynorsk, and all governmental agencies are required to support both written languages. Bokmål is used in 92% of all written publications, and Nynorsk in 8% (2000). Like some other European countries, Norway has an official "advisory board"— Språkrådet (Norwegian Language Council)— that determines, after approval from the Ministry of Culture, official spelling, grammar, and vocabulary for the Norwegian language. The board's work has been subject to considerable controversy throughout the years. Both Nynorsk and Bokmål have a great variety of optional forms. The Bokmål that uses the forms that are close to Riksmål is called moderate or conservative, depending on one's viewpoint, while the Bokmål that uses the forms that are close to Nynorsk is called radical. Nynorsk has forms that are close to the original Landsmål and forms that are close to Bokmål. Opponents of the spelling reforms aimed at bringing Bokmål closer to Nynorsk have retained the name Riksmål and employ spelling and grammar that predate the Samnorsk movement. Riksmål and conservative versions of Bokmål have been the de facto standard written language of Norway for most of the 20th century, being used by large newspapers, encyclopedias, and a significant proportion of the population of the capital Oslo, surrounding areas, and other urban areas, as well as much of the literary tradition. Since the reforms of 1981 and 2003 (effective in 2005), the official Bokmål can be adapted to be almost identical with modern Riksmål. The differences between written Riksmål and Bokmål are comparable to American and British English differences. Riksmål is regulated by the Norwegian Academy, which determines acceptable spelling, grammar, and vocabulary. There is also an unofficial form of Nynorsk, called Høgnorsk, discarding the post-1917 reforms, and thus close to Ivar Aasen's original Landsmål. It is supported by Ivar Aasen-sambandet, but has found no widespread use. In 2010 86.5% of the pupils in the primary and lower secondary schools in Norway receive education in Bokmål, while 13.0% receive education in Nynorsk. From the eighth grade onwards pupils are required to learn both. Out of the 431 municipalities in Norway, 161 have declared that they wish to communicate with the central authorities in Bokmål, 116 (representing 12% of the population) in Nynorsk, while 156 are neutral. Of 4,549 state publications in 2000 8% were in Nynorsk, and 92% in Bokmål. The large national newspapers (Aftenposten, Dagbladet, and VG) are published in Bokmål or Riksmål. Some major regional newspapers (including Bergens Tidende and Stavanger Aftenblad), many political journals, and many local newspapers use both Bokmål and Nynorsk. A newer trend is to write in dialect for informal use. When writing an SMS, Facebook update, or fridge note, most younger people write the way they talk rather than using Bokmål or Nynorsk. 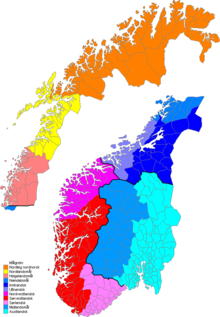 The map shows the division of the Norwegian dialects within the main groups. There is general agreement that a wide range of differences makes it difficult to estimate the number of different Norwegian dialects. Variations in grammar, syntax, vocabulary, and pronunciation cut across geographical boundaries and can create a distinct dialect at the level of farm clusters. Dialects are in some cases so dissimilar as to be unintelligible to unfamiliar listeners. Many linguists note a trend toward regionalization of dialects that diminishes the differences at such local levels; there is, however, a renewed interest in preserving dialects. Ek kom van Noorweë Wat is sy naam? Norwegian nouns are inflected for number (singular/plural) and declined for definiteness (indefinite/definite) and case (nominative/genitive). In some dialects, definite nouns are also in the dative. Norwegian nouns belong to three noun classes: masculine, feminine and neuter. Adjectives and determiners agree in gender with the noun they modifiy. Riksmål and conservative Bokmål traditionally have two genders like Danish, but Nynorsk and most speakers of Norwegian regional dialects use three genders to different extents. The inflection of feminine words like jente using morphemes from the masculine noun class is common in the Bergen and Oslo areas. However, feminine noun class morphology tends to be restricted in most Eastern and Northern dialects to the uses of the definite article. Unlike in Bokmål, in Nynorsk feminine nouns cannot be inflected using masculine noun class morphology. Feminine nouns must be written using the prescribed inflection patterns. There is no way in general to infer what gender a specific noun has, but there some patterns of nouns where the gender can be inferred. For instance, all nouns ending in -nad will be masculine in both Bokmål and Nynorsk (for instance the noun jobbsøknad, which means job application). Most nouns ending in -ing will be feminine, like the noun forventning (expectation). In Nynorsk, even though the irregular word fot is masculine, it is inflected like a feminine word in the plural. Another word with the same irregular inflection is son - søner (son - sons). In Nynorsk, nouns ending in -ing typically have masculine plural inflections, like the word dronning in the following table. But they are treated as feminine nouns in every other way. In general, the genitive case has died out in modern Norwegian and there are only some remnants of it in certain expressions: til fjells (to the mountains), til sjøs (to the sea). To show ownership, there is an enclitic -s similar to English -'s; Sondres flotte bil (Sondre's nice car, Sondre being a personal name). There are also reflexive possessive pronouns, sin, si, sitt, sine; Det er Sondre sitt (It is Sondre's). In both Bokmål and modern Nynorsk, there is often a mix of both of these to mark possession, though it is more common in Nynorsk to use the reflexive pronouns; in Nynorsk use of the reflexive possessive pronouns is generally encouraged to avoid mixing the enclitic -s with the historical grammatical case remnants of the language. The reflexive pronouns agree in gender and number with the noun. The enclitic -s in Norwegian evolved as a shorthand expression for the possessive pronouns sin, si, sitt and sine. Norwegian adjectives inflect for gender, number, definiteness and for comparison (affirmative/comparative/superlative). Most adjectives in all Norwegian dialects and written forms follow the pattern below. en stjålet/stjålen bil - "a stolen car"
den stjålne bilen - "that stolen car"
stjålne biler er et stort problem -"stolen cars are a big issue"
In some Southwestern dialects, the definite adjective is also declined in gender and number with one form for feminine and plural, and one form for masculine and neuter. In Norwegian, a definite noun has a suffixed article (cf. above). However, when a definitive noun is preceded by an adjective (or a numeral), an additional definite article is placed in front of the adjective in the beginning of the noun phrase, so that definiteness is marked twice  since the adjective is inflected as definite as well. In Bokmål, though, the suffixed noun article may be dropped in formal or literary styles. Definiteness is also signaled by using possessive pronouns or any uses of a noun in its genitive form in either Nynorsk or Bokmål: mitt grønne hus ("my green house"), min grønne bil ("my green car"), mitt tilbaketrukne tannkjøtt ("my pulled gums"), presidentens gamle hus ("the president's old house"). Examples of comparative and superlative inflections in Bokmål: "et hvitere hus" (a whiter house), "den grønneste bilen" (the greenest car); "hvitere hus" (whiter house), "grønnest bil" (greenest car). In all dialects of Norwegian and in the written languages, unlike related languages like German, there is also predicative agreement of adjectives. This means that nouns will have to agree with the adjective when there is a copula verb involved, like in Bokmål: «være» (to be), «bli» (become), «ser ut» (looks like), «kjennes» (feels like) etc. Norwegian finite verbs are inflected or conjugated according to mood: indicative/imperative/subjunctive. The subjunctive mood is constrained to only a handful of verbs. Indicative verbs are conjugated for tense: present / past / future. The infinitive, present and past tense also have a passive form. In a few dialects, indicative verbs are also conjugated according to number. Agreement with person is lost in Norwegian. There are four non-finite verb forms: infinitive, passive infinitive, and the two participles: perfective/past participle and imperfective/present participle. The participles are verbal adjectives. The imperfective participle is not declined, whereas the perfect participle is declined for gender (though not in Bokmål) and number like strong, affirmative adjectives. The definite form of the participle is identical to the plural form. As with other Germanic languages, Norwegian verbs can be either weak or strong. There are ergative verbs in both Bokmål and Nynorsk, where there is two different conjugation patterns depending on if the verb takes an object or not. In Bokmål, there are only two different conjugations for the preterite tense for the strong verbs, while Nynorsk has different conjugations for all tenses, like Swedish and a majority of Norwegian dialects. Some weak verbs are also ergative and are differentiated for all tenses in both Bokmål and Nynorsk, like «ligge»/«legge» that both means to lie down, but «ligge» does not take an object while «legge» requires an object. «legge» corresponds to the English verb «lay», while «ligge» corresponds to the English verb «lie». There are however many verbs that do not have this direct translation to English verbs. Norwegian personal pronouns are declined according to case: nominative / accusative. Like English, pronouns in Bokmål and Nynorsk are the only class that has case declension. Some of the dialects that have preserved the dative in nouns, also have a dative case instead of the accusative case in personal pronouns, while others have accusative in pronouns and dative in nouns, effectively giving these dialects three distinct cases. In the most comprehensive Norwegian grammar, Norsk referansegrammatikk, the categorization of personal pronouns by person, gender, and number is not regarded as inflection. Pronouns are a closed class. The words for «mine», «yours» etc. are dependent on the gender of the noun it describes. Just like adjectives, they have to agree in gender with the noun. Bokmål has two sets of 3rd person pronouns. Han and hun refer to male and female individuals respectively, den and det refer to impersonal or inanimate nouns, of masculine/feminine or neutral gender respectively. In contrast, Nynorsk and most dialects use the same set of pronouns han (he), ho (she) and det (it) for both personal and impersonal references, just like in German and Icelandic. Det also has expletive and cataphoric uses like in the English examples it rains and it was known by everyone (that) he had travelled the world. Unlike Swedish and Danish, the ordering of possessive pronouns are a bit more free. When there is no adjective, the most common word order is the one used in the examples in the table above, where the possessive comes after the noun, while the noun is in its definite form; «boka mi» (my book). If one wishes to emphasize the owner of the noun, the possessive pronoun usually come first. In Bokmål however, due to its Danish origins, one could choose to always write the possessive first «min bil» (my car), but this may sound very formal. Some dialects that have been very influenced by Danish do this too, some speakers in Bærum and the west of Oslo may always use this word order. When there is an adjective describing the noun, the possessive pronoun will always come first; «min egen bil» (my own car). The closed class of Norwegian determiners are declined in gender and number in agreement with their argument. Not all determiners are inflected. Norwegian has five closed classes without inflection, i.e. lexical categories with grammatical function and a finite number of members that may not be distinguished by morphological criteria. These are interjections, conjunctions, subjunctions, prepositions, and adverbs. The inclusion of adverbs here requires that traditional adverbs that are inflected in comparison be classified as adjectives, as is sometimes done. In Norwegian compound words, the head, i.e. the part determining the compound's class, is the last part. If the compound word is constructed from many different nouns, the last noun in the compound noun will determine the gender of the compound noun. Only the first part has primary stress. For instance, the compound tenketank (think tank) has primary stress on the first syllable and is a masculine noun since the noun «tank» is masculine. Compound words are written together in Norwegian, which can cause words to become very long, for example sannsynlighetsmaksimeringsestimator (maximum likelihood estimator) and menneskerettighetsorganisasjoner (human rights organizations). Other examples are the title høyesterettsjustitiarius (Chief Justice of the Supreme Court, originally a combination of supreme court and the actual title, justiciar) and the translation En midtsommernattsdrøm for A Midsummer Night's Dream. If they are not written together, each part is naturally read with primary stress, and the meaning of the compound is lost. Examples of this in English are the difference between a green house and a greenhouse or a black board and a blackboard. This is sometimes forgotten, occasionally with humorous results. Instead of writing, for example, lammekoteletter (lamb chops), people make the mistake of writing lamme koteletter (lame, or paralyzed, chops). The original message can even be reversed, as when røykfritt (lit. "smoke-free" meaning no smoking) becomes røyk fritt (smoke freely). Any piece of the sentence could be placed first to highlight its importance, but the finite verb must always come second. Adjectives always precede the noun that they modify. Norwegian ambulances changed their markings in 2005. This is the old appearance, with the Norwegian ambulanse, "Ambulance." By far the largest part of the modern vocabulary of Norwegian dates back to Old Norse. The largest source of loanwords is Middle Low German, which had a huge influence on Norwegian vocabulary from the late Middle Ages onwards partially even influencing grammatical structures, such as genitive constructions. Bokmål and many dialects have these loanwords, while Nynorsk is more puristic and has many of these words replaced with words that are derived from Old Norse, Nynorsk thus shares more vocabulary with Icelandic and Faroese. There are Middle Low German vocabulary in Nynorsk too, but to a lesser extent than Bokmål. At present, the main source of new loanwords is English e.g. rapper, e-mail, catering, juice, bag (originally a loan word to English from Old Norse). Some loanwords have their spelling changed to reflect Norwegian pronunciation rules, but in general Norwegianised spellings of these words tend to take a long time to sink in: e.g. sjåfør (from French chauffeur) and revansj (from French revanche) are now the common Norwegian spellings, but juice is more often used than the Norwegianised form jus, catering more often than keitering, service more often than sørvis, etc. For a list of words relating to Norwegian language, see the Norwegian language category of words in Wiktionary, the free dictionary. Wikivoyage has a phrasebook for Norwegian. Wikisource has the text of the 1905 New International Encyclopedia article Norwegian Language. ^ "Norwegian". Ethnologue. Retrieved 24 January 2018. ^ Hammarström, Harald; Forkel, Robert; Haspelmath, Martin, eds. (2017). "Norwegian". Glottolog 3.0. Jena, Germany: Max Planck Institute for the Science of Human History. ^ "Konvention mellan Sverige, Danmark, Finland, Island och Norge om nordiska medborgares rätt att använda sitt eget språk i annat nordiskt land" [Convention between Sweden, Denmark, Finland, Iceland and Norway on the right of Nordic citizens to use their own language in another Nordic country]. Nordic Council (in Norwegian). 2 May 2007. Archived from the original on 20 February 2009. Retrieved 4 May 2008. ^ "20th anniversary of the Nordic Language Convention". Nordic Council. 22 February 2007. Archived from the original on 27 February 2007. Retrieved 25 April 2007. ^ Anthony, David W. (2007). The Horse, the Wheel, and Language : How bronze-age riders from the Eurasian steppes shaped the modern world (8th reprint. ed.). Princeton, N.J.: Princeton University Press. ISBN 978-0-691-05887-0. ^ a b c Faarlund, Jan Terje; Haugen, Einar (1917). "Scandinavian languages". Encyclopædia Britannica. 99 (2495): 505. Bibcode:1917Natur..99..505T. doi:10.1038/099505a0. Retrieved September 11, 2016. ^ Husby, Olaf (October 2010). "The Norwegian language". Norwegian on the Web. Retrieved 11 September 2016. ^ Torp, Arne (2001). "Bokstaver og alfabet" [Letters and alphabet]. Språknytt (in Norwegian) (4): 1–4. Retrieved 23 June 2018. ^ Vannebo, Kjell Ivar (2001). "Om begrepene språklig standard og språklig standardisering" [About the terms linguistic standard and linguistic standardization]. Sprog I Norden (in Norwegian): 119–128. Retrieved 23 June 2018. ^ Kristoffersen, Gjert (2000). The Phonology of Norwegian. Oxford University Press. pp. 6–11. ISBN 978-0-19-823765-5. ^ "Læreplan i norsk (NOR1-05)". www.udir.no (in Norwegian Bokmål). Retrieved 2018-07-19. ^ Venås, Kjell (1994). "Dialekt og normaltalemålet" [Dialect and normal speech]. Apollon (in Norwegian). 1. ISSN 0803-6926. Archived from the original on 24 July 2011. ^ "Bøying". www.ressurssidene.no (in Norwegian Bokmål). Retrieved 2018-07-14. ^ a b "Språkrådet". elevrom.sprakradet.no. Retrieved 2018-07-14. ^ "Bokmålsordboka | Nynorskordboka". ordbok.uib.no. Retrieved 2018-07-14. ^ "Språkrådet". elevrom.sprakradet.no. Retrieved 2018-07-17. ^ 1906-1970., Berulfsen, Bjarne (1977). Norwegian grammar (4. impression ed.). Oslo: Aschehoug. ISBN 978-8203043123. OCLC 4033534. ^ Fossen, Christian. "1 Repetisjon". www.ntnu.edu. Retrieved 2018-07-14. ^ "Språkrådet". elevrom.sprakradet.no. Retrieved 2018-07-12. ^ "Predikativ". ressurssidene.pedit.no (in Norwegian Bokmål). Retrieved 2018-07-14. ^ "Språkrådet". elevrom.sprakradet.no. Retrieved 2018-07-14. Ordboka - Online dictionary search, both Bokmål and Nynorsk. Fiske, Willard (1879). "Norway, Language and Literature of" . The American Cyclopædia. This page was last edited on 21 April 2019, at 15:40 (UTC).